Spartans enjoy the Homecoming Party at Kaplan Commons on Saturday. 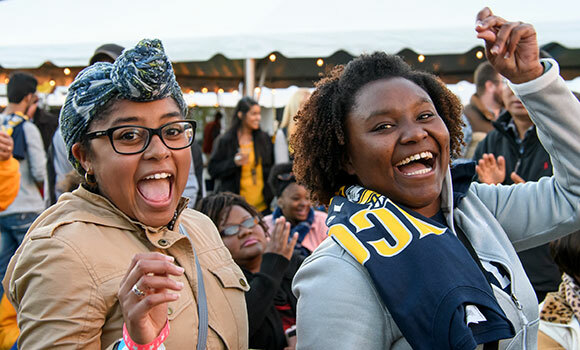 Thousands of Spartans returned to campus last week for UNCG’s Homecoming celebration, an annual event marked by university traditions, soccer rivalries and plenty of UNCG pride. This year’s highlights? The second annual Spartan Hop on Friday night, the Homecoming Parade of Chariots on Saturday afternoon and the Homecoming Party at Kaplan Commons – complete with great music, food and giveaways – to cap off the weekend. Not to mention a visit by “America’s Got Talent” host Nick Cannon at Thursday night’s Spartan Madness event for students. Over the course of the celebration, UNCG alumni, students, faculty, staff and community members shared their favorite Homecoming photos and videos on social media using the hashtag #uncghome. Check out the Storify post below for a recap of all the festivities.